Riley Surface World is a trading name of Riley Industries Ltd. The company was founded in 1966 as Barry Riley and Sons. The original premises were located in Central Birmingham, UK, close to the world-famous Hockley jewellery quarter. Barry Riley started by trading in recycled nickel during the great nickel shortage of the late 1960s, supplying the large number of nickel plating companies that existed at that time. This steady income allowed the company to diversify into a much wider range of second hand surface finishing plant and machinery. 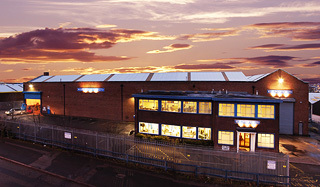 It eventually moved to larger premises at Perry Barr to the North of Birmingham city centre, where the business flourished throughout the 1980s and 1990s. Today, Riley Surface World occupies a large 5000 square metres headquarters at Aldridge on the outskirts of Birmingham. This modern facility has space for over 1000 items of used surface finishing plant & machinery. The warehouse has industrial-sized loading and unloading bays, overhead cranes throughout and substantial repair and refurbishing facilities. There is a prestigious showroom and ample conference and meeting areas. Riley Surface World is staffed by a team of fully experienced surface finishing professionals, who are able to provide advice and technical support to assist with your machinery purchases. We also have the expertise to evaluate all of the machinery that we buy in the marketplace. We are always prepared to pay the market value price for good quality used surface finishing machinery in working order. And we are here to help you realise the full value of your surplus assets. Riley Surface World has invested heavily in new technology, including all digital marketing techniques and expertise. Our website is a dedicated tool for surface finishing engineers, manufacturers, re-manufacturers, sub-contractors and anyone involved in surface finishing and coating processes. We hold a substantial database of surface finishing professionals throughout the world. This gives us the power to attract the very best equipment in the industry and to market your equipment successfully using targeted online marketing systems. Our company is a member of numerous trade associations in both the surface finishing and machinery dealing fields. This underpins our reputation for honest dealing and strict adherence to all business ethics and codes of practice.